Longstanding Doncaster socialist Mary Jackson has sadly died after a year-long battle against cancer. We send condolences to her husband of 50 years John, and their children Michael, Carol and Peter. Mary became a socialist through her experiences in the 1984 miners' strike, when with her friend she would picket the local pit and got involved in Women Against Pit Closures. Her other huge influence was reading Robert Tressell's classic novel The Ragged-Trousered Philanthropists. Mary kept wishing this book was updated and finally decided to take that job on herself by writing The Great Money Trick, which explains how the workers are robbed by the bosses. Partly autobiographical, this is a wonderful glimpse into working class life in her village, Thorne, where she lived for 50 years. From the mid-1990s Mary stood as a socialist election candidate in Thorne several times, always getting a good vote, reflecting how well-known and respected she was. In the 2010 general election she felt privileged to be asked by the transport trade union RMT to be the election agent for its member Bill Rawcliffe who wanted to stand against Ed Miliband, at that time a New Labour cabinet minister, after a mass meeting of rail engineering workers who had just been sacked. 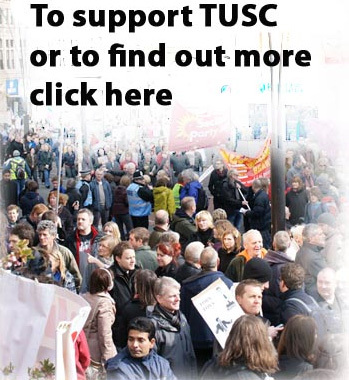 TUSC was formed just weeks before the 2010 general election, with the aim of providing a common banner for trade unionists, socialists and working class community activists to contest elections. This banner was taken up by Bill Rawcliffe, who was the RMT senior steward at the Jarvis Rail services company, when Jarvis went into administration on March 25th and made 1,200 workers redundant while the Labour government stood by. But who in Doncaster could throw themselves into being the election agent at such short notice? Mary Jackson, a member of the Socialist Party, a TUSC constituent organisation alongside the RMT, was the obvious answer - and was warmly thanked by Bill in his election count speech (see http://www.youtube.com/watch?v=JT0Z9Hb2I14) which became a YouTube hit for showing Ed Miliband's discomfort when faced with a working class voice of protest. In 2013 Mary stood herself as the TUSC candidate for the mayor of Doncaster, in a campaign launched at a packed meeting in the Trades Club alongside the late Bob Crow, then general secretary of the RMT. Standing as 'Socialist Mary' against the Tory's bedroom-tax and Labour's council cuts, she gained 1,916 votes, more than one of the coalition 'parties of government'. Mary lived her life as a socialist. As a citizens' advice worker for over 30 years she helped literally thousands of people, and volunteered at the foodbank in Thorne. She battled through all her own adversities to help other people. Mary Jackson was such a strong woman, a working class fighter and an eternal optimist in a socialist future, an inspiration to all who had the privilege to struggle alongside her for a better society. Mary thought she would go on forever. Sadly not, but we can carry on her fight against injustice and inequality and for that socialist future she so believed in.